If you work in an industrial facility, it is often difficult to find the detailed data needed to solve a problem or improve a process. Even operators with access to real-time data streaming in from control and automation systems often struggle to understand problems that they are observing. Why is this the case? 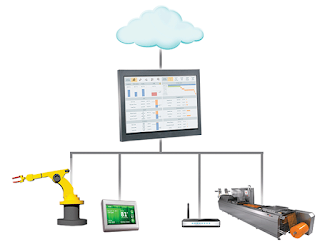 Many industrial facilities use embedded human machine interface (HMI) applications like InTouch Machine Edition to display real-time process data and control modern industrial processes. Capturing and storing this process data is often done on a spotty basis. 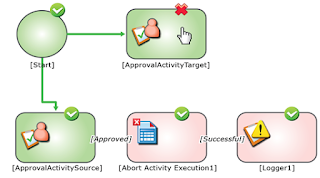 When problems come up, a complete process history is often not available. Without a complete process history everyone is less effective and the ability to improve processes becomes difficult. 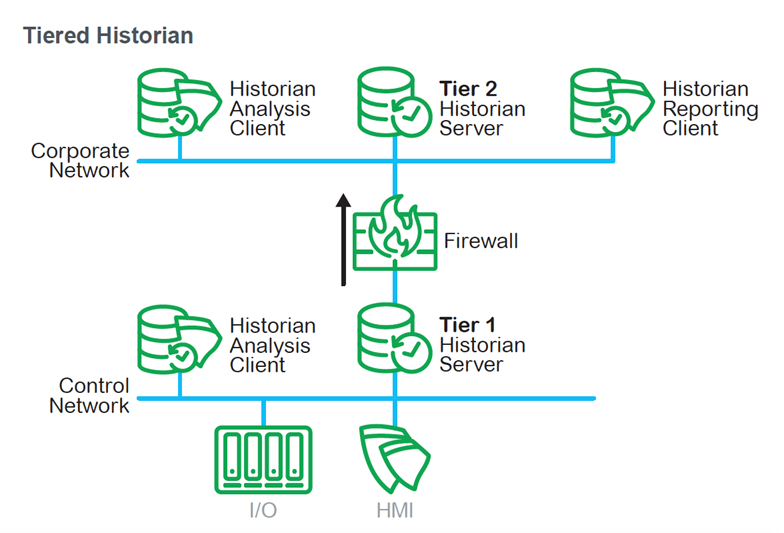 Today, process data historians provide a proven way to capture and store data coming from HMI systems and closing gaps in the process history archive. 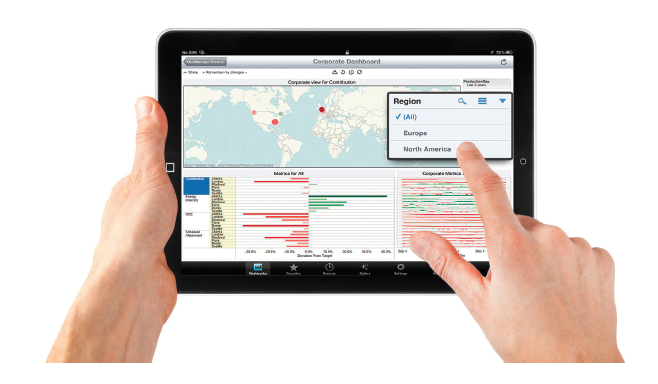 There are many reporting and analysis tools available to access process data stored in Wonderware Historian. 1. Total data volume – modern control/supervisory systems generate huge volumes of data; several months of data can easily reach hundreds of gigabytes. 2. Data storage rates – tens of thousands of data values per second are common in industrial environments and are beyond the abilities of common relational database systems. 3. Time series data - continuous physical properties such flows and temperatures are measured periodically over time. Storing and retrieving this type of data is not easily accomplished by relational databases. Wonderware Historian is designed to overcome each of these significant relational database shortcomings. Various Wonderware Historian configurations are available for every size and type of industrial process – from collecting data on a single machine, process, to an entire plant, and even covering multi-site global enterprises. If you can’t connect to your data you can’t capture a complete process history. The Wonderware® Historian allows you to capture data on essentially every parameter displayed on the Wonderware Machine Edition HMI. 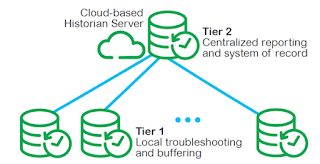 Wonderware Historian also offers broad connectivity to third party data sources and has OPC connectivity. With any software application, proper implementation is a key success factor. It is no different for process historians. 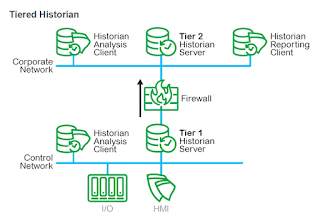 However, historians that are integrated with HMIs can save large amounts of configuration time along with significantly reducing implementation risk. For example, Wonderware Historian can use the Wonderware InTouch® Machine Edition tag list to automatically configure itself. 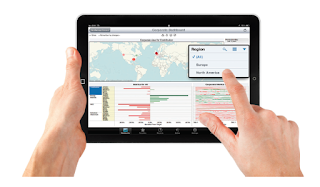 The process is automated so it takes less time and reduces the risk of configuration errors. 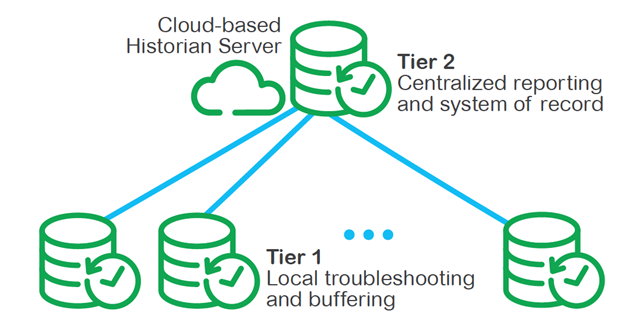 Not only can Wonderware Historian be scaled for a wide range of industrial applications, it also allows for “tiering”, offering a significant advantage over many competitor’s products. When set up in a multi-tier historian configuration as shown below, lower level historian(s) (tier 1) collect data at the local machine level. Data is made available to workers at the this level, but all or some of the tier 1 data can be sent to a higher level, tier 2 historian for archiving, or can be automatically summarized for easier analysis, or even be easily integrated into an existing ERP system. While it is great to have real-time access to your process history, what do you do if you find something you want to take action on? Ad-hoc actions are useful but what if you want to track the work activities related to a problem discovered after viewing historian data? Workflow management applications, like Wonderware Workflow®, are integrated with applications such as HMI, historian, MES, and notifications such as SMS, email, and other systems to help ensure that specific work tasks are executed properly every time. Each work task is tracked so management has a record of what was done and when it was done, to allow for future machine, process, or plant improvement. Additionally, using workflow management solutions are particularly important when dealing with regulatory and safety issues. A complete process history is vital to modern industrial companies if they want to minimize cost, maximize productivity, reduce waste, and maintain safety and environmental compliance. Wonderware Historian is a software applications that can be seamlessly integrated with embedded InTouch Machine Edition HMI applications and more extensive Wonderware System Platform applications, to provide a complete process history for later troubleshooting and analysis. Wonderware Historian is highly scalable, secure and can provide useful information to any type of operator or analyst through a broad selection of desktop and mobile reporting and analysis clients. Historians and HMI applications provide an ideal solution to any industrial company looking to optimize their operations and maximize their results.